Manchester City reignited their Premier League title challenge with a crucial 2-1 win over leaders Liverpool. Leroy Sane's superb second half strike handed Liverpool their first league defeat this season and moved the champions to within four points of Jurgen Klopp's side. 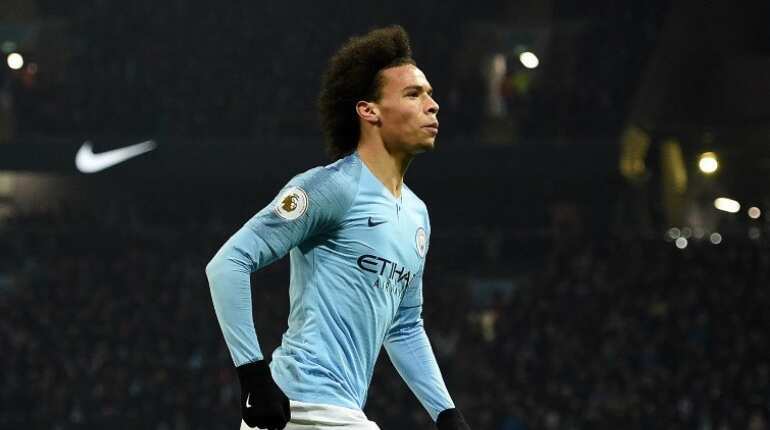 A season that started with Leroy Sane's future at City in doubt is no longer a tale of woe for the German winger, who underlined his vast potential with the blistering winner that kept the champions' title hopes alive. Frustrated after being left out of Germany's World Cup squad, Sane began City's first three league games on the bench and was then left out entirely for the trip to Newcastle amid claims Pep Guardiola was concerned by the youngster's focus in training. The close-season signing of Riyad Mahrez from Leicester was another impediment to Sane's progress. "It is the toughest situation I have to handle," Guardiola said at the time. "When Sane plays he has to play well. I am pretty sure of that." But the 22-year-old gradually regained Guardiola's trust and returned to the team, although it wasn't until October -- when he scored four times in five games -- that Sane really showed his true colours. Sane's ninth goal for City this season came after he also played an important role in unhinging Liverpool's defence in the build-up to Sergio Aguero's opener. Liverpool claimed it had gone in, but goalline technology showed that a tiny portion of the ball -- just 1.12cm according to Premier League statistics -- hadn't crossed the line, meaning the decision to play on was correct. "I heard it was tight. I'm just happy it didn't go over the line! Those sort of things can change a game," Stones smiled. 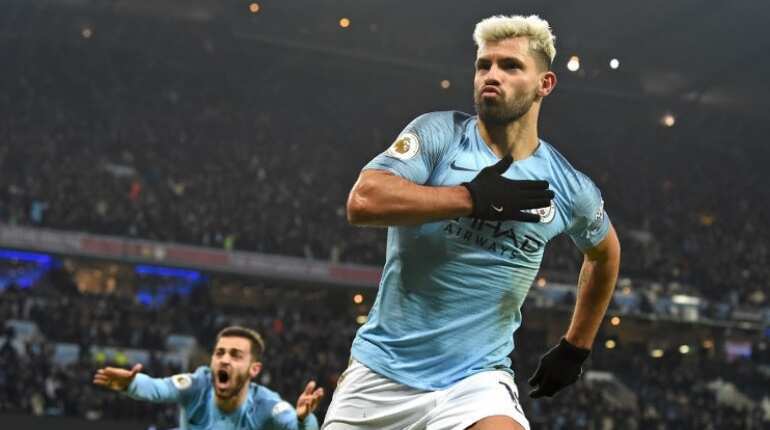 Sergio Aguero has feasted on Liverpool at the Etihad Stadium and once again the Reds had no answer to City's lethal finisher. Aguero's 40th minute opener extended his streak of having scored in all seven of his home league games against Liverpool. Having just appealed in vain for a penalty after being barged over by Virgil van Dijk, Aguero kept his composure and exacted his revenge seconds later with his 250th career league goal. When Bernardo Silva played the ball back into the Liverpool area, Aguero had barely moved from his position, but Dejan Lovren didn't react quickly enough and the Argentina forward made a clever run across him. 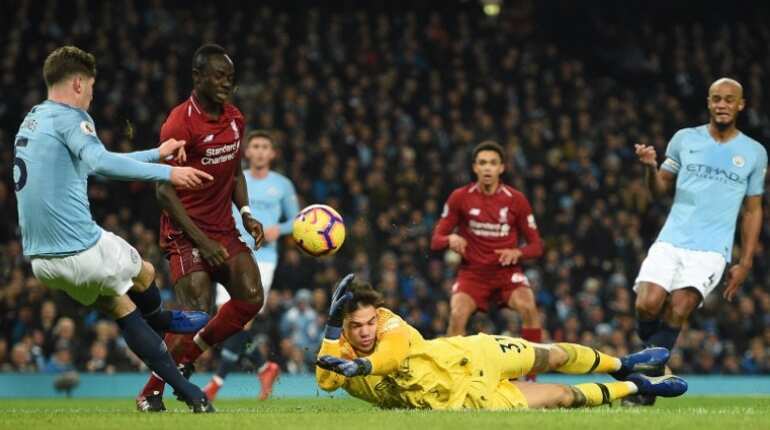 Showing sublime control with his first touch, Aguero smashed a superb shot past Alisson Becker into the roof of the net from the tightest of angles. 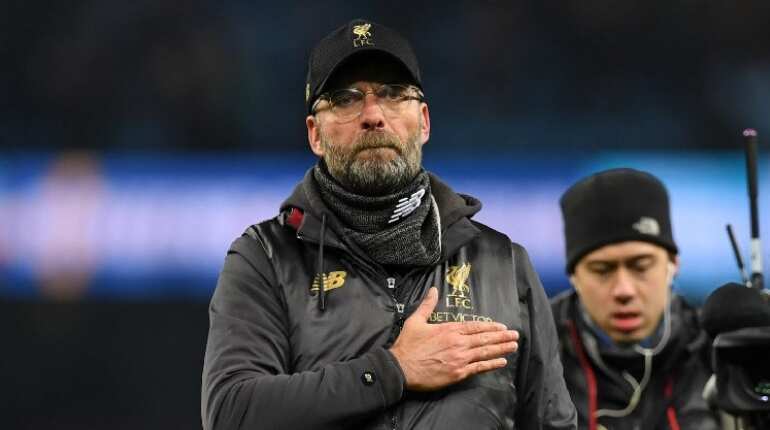 When video emerged of Jurgen Klopp ringing in the new year by breaking out some dubious dance moves at a party earlier this week, it was jokingly suggested the Liverpool boss was already preparing for his club's title celebrations. After all, it was 242 days since Liverpool last lost a Premier League game in a 1-0 defeat at Chelsea in May. 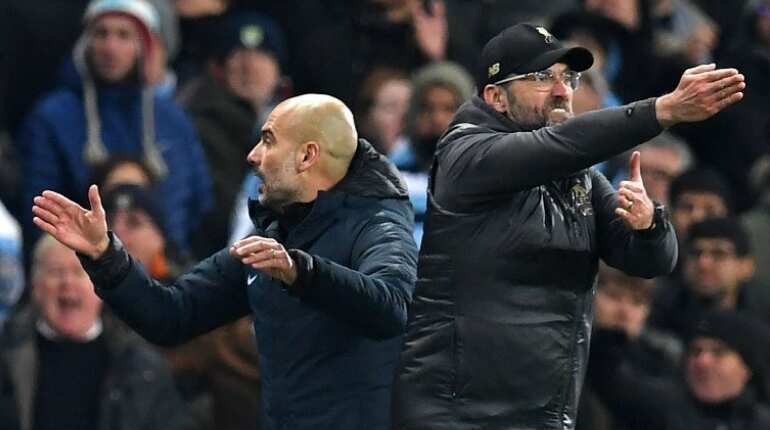 And the Reds arrived at the Etihad boasting a nine-game winning run in the league and knowing a victory would put them well clear at the top while likely killing off City's challenge. But Liverpool, who were last crowned champions in 1990, are haunted by the ghosts of the past when Steven Gerrard's slip let City steal the title from them and once again they were punished for failing to seize the moment. It is too early to know whether this rather patchy display will prove as costly, yet Liverpool head back nursing a new year's hangover that make take a while to clear.